Link removed in request of Fat Beats Records. 2 compilations full of remixes by Madlib released (only on vinyl) in 2000 and 2004 , Madlib originally intended the remixes for personal use but decided to independently release them, enjoy! Link removed in request of Stones Throw. 18. Nas – Nasty N.
Debut collaborative album from MF DOOM and Jneiro Jarel (aka Shape of Broad Minds/ Dr. Who Dat?) under the moniker JJ DOOM. The album will appeal to fans of classic DOOM material. JJ’s tough, far out hip hop production will appeal to fans of J Dilla, Flying Lotus and El-P. “KEY TO THE KUFFS’ features guest appearances from Beth Gibbons (Portishead), Damon Albarn (Gorillaz) and Khujo (Goodie Mob). Tracks from the album have already been remixed by Thom Yorke & Jonny Greenwood (Radiohead) and Dave Sitek. Album artwork is by graffiti artist Steve Powers aka ESPO. Link removed in request of Lex Records. From the duo who brought you the modern classic Below The Heavens comes the first official release in anticipation of their forthcoming follow up album Give Me My Flowers While I Can Still Smell Them. Dirty Science & Fat Beats are proud to release the Maybe One Day EP, a limited 10″ featuring marquee tracks and instrumentals from Blu & Exile. While merely a taste of what is to come, “Maybe One Day” Is the perfect step in reaffirming the duo’s position at the forefront of LA’s burgeoning beat scene. Link removed in request of Fat Beats. The time has come. A collaboration for the ages which trancends musical categories. The greatest hip hop producer in history meeting with a gatekeeper of the Detroit music and culture. A clash of two titans, JDilla and K.D.Jr. a.k.a. “MoodyMann”, the legendary music producer. These two Detroiters and friends should have collaborated long ago. “DillaTroit” E.P. is documentation for all historians and music lovers worldwide. “MoodyMann” has reached within his artistic greatness to express his love and appreciation for JDilla and the “Rebirth of Detroit” with his stylings on this very rare and one time vinyl release for Mahogani Music and Ruff Draft Records. J Dilla’s mother, Mrs. Maureen “MaDukes” Yancey, is pleased to announce a new album of unreleased material from her son. “Rebirth of Detroit” will feature new music from the late producer, as well as Detroit’s finest emcees and musicians who have both worked with and/or been influenced by J Dilla including Amp Fiddler, Illa J, Frank Nitt, Chuck Inglish (Cool Kids), Boldy James, Phat Kat, Guilty Simpson, Jay Electronica, Asher Roth, Danny Brown, DJ J-Rocc of the Beat Junkies, DJ Dez, Fat Ray, Will Sessions and more. It was important to Maureen Yancey that this project be a collaboration of emcees and musicians working in the Detroit Hip Hop community. All songs produced by J Dilla except “Let’s Pray Together” co-produced by Amp-Fiddler. New stuff from Blu, 15 tracks all produced by Madlib, enjoy! After waiting patiently behind two singles, a dope video, and a neon-blue triangle shaped vinyl, Union is ready to unleash the most musically challenging, painstakingly crafted, MC-packed album in the dawn of 2012 – Analogtronics. Featuring Talib Kweli, Elzhi, MF DOOM, Roc Marciano, Guilty Simpson, and more, Union produces space-aged bangers that mold perfectly around each guest, in addition to sprinkling in a few lush, eye-widening instrumentals. This is the full length we have all been waiting for. Talib Kweli & Yasiin Bey are Black Star. 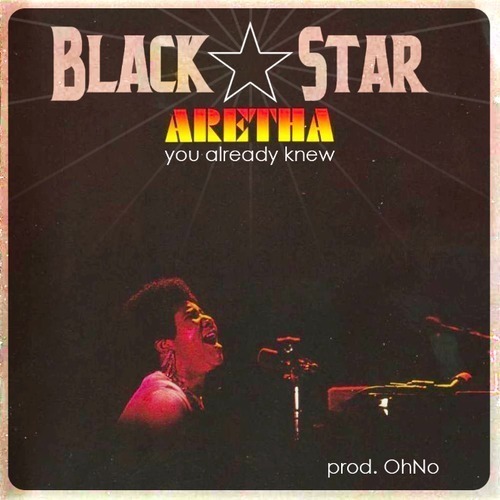 “You Already Knew,” produced by Oh No, is the first song off ‘Black Star Aretha,’ the group’s tribute to the legendary singer, Aretha Franklin. After years of speculation and delays, multi-platinum, Grammy award winning producer 9th Wonder is set to release his long awaited solo album The Wonder Years. The former Little Brother member brings a star-studded cast to the album that includes Erykah Badu, Raekwon, Talib Kweli, Murs, Mac Miller, Saigon, Kendrick Lamar, Warren G, Big K.R.I.T, Pharoahe Monch, Marsha Ambrosius, Skyzoo, Big Remo, Rapsody, and former Little Brother groupmate Phonte Coleman. New Studio album from West Coast hip hop artist Declaime also known as Dudley Perkins. Titled Self Study, the album is a introspective look at Dudley’s own self growth and his transition from an MC into a label owner. The album also serves as a wakeup call to the people of planet earth and is meant to be a tool to help raise the vibration on this planet. The album is being released on July 12th on his own label Someothashipconnect. The 17 track album is produced entirely by artist/producer Georgia Anna Muldrow, and also includes a 60 minute documentary called Inter Planetary Peace Talks. In this man are the traces of becoming. the display of veins strung into a multi-colored silhouette of a man born out of the electric dawn of the late seventies. Birthed from a songwriter father who struggled to unveil to his son the distortion world of drugs, song, and love, he discovered early that we are all in exile from one another. The boy grew up fascinated with the world of horror films, new wave pop, rap music, and graffiti. His spray paint fingers grazed dusty record sleeves, transformed a cheep home stereo into a mixer, and connected a young man with the current that changed his head. After years of journeying through sweat drenched undergrounds, and strobe light shadows, a man emerged. One who finds consolation in the fractal universe, one who has discovered love in a Technicolor death valley, and one who realized that those of the Diaspora of love can find community through song, he radiates wax for us. A man who is wired to the electric field of his past where he has loves and lost, and discovered the intervals of an off beat, kinetic world, he offers his songs as flesh, this music is an artifact of a man who shares his quantum of experience, who wants you to plug into his design, bridge the gap of our individual exiles, and discover the art of becoming electric through analog tape hiss. Recently, a mysterious album titled Jesus turned up on the popular music site Bandcamp, uploaded by an artist calling himself “B”. Soon, the LP was discovered to be the latest work from enigmatic L.A. rapper Blu, and within hours, it was the talk of the blogosphere. Featuring production from Madlib, Alchemist, and Hezekiah, and an appearance from Planet Asia, Jesus features some of the most intriguing collaborations of Blu’s career. With fully mastered audio, plus CD and vinyl editions, this important edition to Johnson Barnes’ catalog will finally be heard as it was meant to be. Officially the debut for alter-ego “B”, Jesus is sure to satisfy the cult-like fanbase that’s been steadily growing around the artist most famously known as Blu. Pete Rock & Smif-N-Wessun have joined forces for a MONUMENTAL album. Pete Rock has provided the entire production on the album, as well as vocals on several key tracks including the title track, “MONUMENTAL.” The album features Bun B, Raekwon, Styles P, Sean Price, Pharoahe Monch, Buckshot, Black Rob, Freeway, Memphis Bleek, Rock of Heltah Skeltah, Hurricane G, Top Dog of Boot Camp Clik, and Jahdan of Noble Society. Troy ‘Co$$’ Johnson has been bubbling on the LA scene with his tales of love lost and gained and hard street rhymes all told with heartfelt integrity. Hailing from Leimert Park, Co$$ is an artist who uses vivid imagery and sharp rhymes in his delivery to paint a clear picture of his content. Named as LA’s most underrated rapper in the LA times, Co$$ is beating off his competition. Co$$ will no doubt make some huge waves with a debut album bursting with creativity, unique flow and original, introspective content. The production is remarkably varied, with synth laden melodies merged with dusty loops throughout in a melting pot that includes beats from Exile. The perfect balance has been made with songs that make you screw your face up (see ‘Da Meanest’ Prod. by Exile), and thought provoking, captivating sound scapes (see ‘Scriptures’ prod. by The Soul Academy). With a beautifully polished intro, ‘Risen’ brings forth that ‘shiver down your spine’ music. In typical Tres fashion, ‘Spaceman’ delivers a laid back west coast sound laced with fly pianos and a hook reminiscent of the classic Dr. Dre or Snoop Dogg bounce. Tracks such as ‘In The Wind’ give the listener that instant head nod essence. Co$$’s label mate Shawn Jackson adds one of two features to the song with his usual experience and prowess.